Do you long for a full course holiday meal? Are you military and your family is far away? Are you new to the church and don’t know many people? Are you caring for an elderly relative and don’t have time to cook for the holiday? Are you exhausted and too tired to cook a holiday meal after an early morning sunrise service? If you answered yes to any of these questions, then we’re here for you! 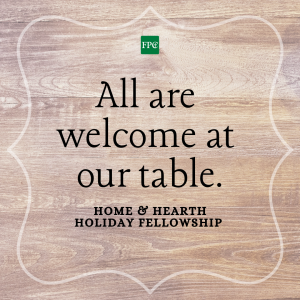 Your Home & Hearth Church family, is planning a potluck dinner on Easter Day, and you’re invited! The Congregational Care Committee will provide an Easter ham and drinks. Everyone who participates will fill in with sides, salads, and desserts. The luncheon will start after the 11am Easter Service as soon as the food is heated and the buffet is ready to serve. or email Kellie Perkins at kperk16@gmail.com. And remember, your family looks forward to having you join them on Easter Day!